The UN Security Council meeting with internally displaced persons in northern Cameroon on 3 March 2017. The United Nations Security Council is today in Chad, as part of a four-country visit “to shine a spotlight” on the ongoing humanitarian challenges in the Lake Chad Basin region and draw international attention to the plight of about 11 million people. In the Chadian capital of N'Djamena, the Council met with Prime Minister Albert Pahimi Padacké and visited the Multinational Joint Task Force (MNJTF), which includes troops from the four affected regional countries – Cameroon, Chad, Niger and Nigeria, plus Benin – in the fight against Boko Haram. “The Security Council welcomed the efforts to fight Boko Haram and encouraged more regional cooperation,” according to a Tweet by the Permanent Mission of the United Kingdom to the UN which has the Security Council's rotating presidency for the month of March and is leading the visit. Discussions with the Prime Minister also focused on the economic situation in Chad and the importance of women participating in the economy and politics. Also today, the Council members met with representatives of the UN agencies, funds and programmes and non-governmental organizations working in the country. 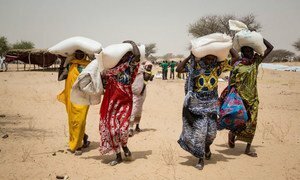 They are working to aid the millions of people who, in addition to the security threat from Boko Haram and the fight against the terror group, also face a major food and nutrition crises. Some 2.4 million people are currently displaced in the area, according to UN figures, and more than 7.1 million are severely hungry. In his conversations with the Council, Stephen Tool, the UN Humanitarian Coordinator and Resident Coordinator in Chad, detailed the severe challenges in the countries, which include malnutrition, disease and health, sanitation. He noted, however, that “you cannot deal with humanitarian issues without looking at the root causes” which include insecurity, development gaps, lack of education, poor agriculture, and so on. The Security Council delegation, led by Ambassador Matthew Rycroft of the United Kingdom, had yesterday visited Cameroon, where members met with President Paul Biya and other senior Government officials. The Council also met with refugees and people displaced by Boko Haram and the forces tracking them. In a blog post, Mr. Rycroft detailed meeting two young survivors of Boko Haram's violence. The first, a boy who was 13 years old when the terrorist group stormed his village and killed his friends and family. The other boy was about 10 years when he was kidnapped, escaped, and has since 2014 lived in a camp for internally displaced persons. Speaking earlier in the day, Mr. Rycroft outlined his vision for the visit. “First of all, we came here in order to shine a spotlight on the situation in the Lake Chad Basin. “We came to hear the individual stories of people involved, whether they are refugees or displaced people or other victims of Boko Haram. The delegation heads to Niger later today, and is scheduled to continue on to Nigeria tomorrow. Giving voice to people affected by conflict and crises in Africa’s Lake Chad Basin, a global United Nations-supported humanitarian conference in Oslo today generated more than $670 million in pledges that will help sustain critical relief operations over the next two years and beyond across four counties where millions are in need of aid.